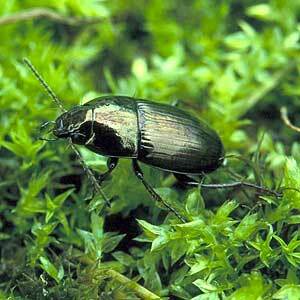 Description: A common 6-8mm brassy Amara occurring in moss and litter very widely, also in upland peat. Phytophagous. World Distribution: A Eurasian Boreo-temperate species (55) found across Europe, south to the Caucasus, and east across Siberia to Kamchatka. Introduced to North America (Bousquet, 1992). Irish Status: Widespread and fairly common in northern counties but status elsewhere difficult to gauge at present. Ecology: Eurytopic and recorded from agricultural land, lightly wooded areas and occasionally on drier Calluna heaths in the hills.